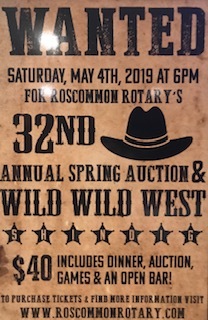 Roscommon Rotary is hosting their 32nd Annual Spring Auction on Saturday, May 4th at 6pm at the Roscommon Knights of Columbus Hall. This year’s theme is “Wild Wild West Shindig!”. As usual, the evening will include a fabulous catered menu, music, and a high-end open bar. The club’s goal is to raise funds and throw Roscommon’s Best Party of the Year. Cost: $40 per person from members or $44 online.